3040QD - Ultimate Washer offers hot water power washers designed to meet every need of the local, state and federal governments. This machine produces the total of 12,000 cleaning units and can heat up water to up to 140°F, so it can remove any dirt that is put in front of it. 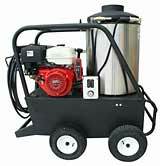 This pressure washer comes with a totally closed engine that protects it from rust and corrosion. Use it for tough cleaning applications including concrete, walkways, parking lots, play structures, maintenance areas, airport apron surfaces and runways. 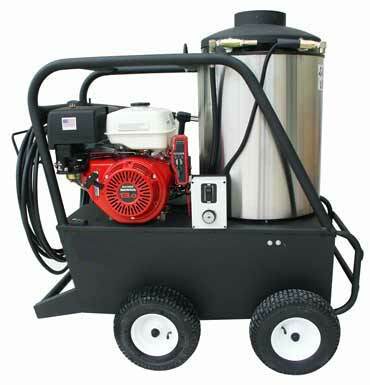 Some of the features include triplex plunger pump with ceramic plungers and stainless steel valves, chemical injection, quick change tips in 0°, 15°, 25°, 40° soap tip, dual wand with side handle and detergent tip, trigger gun, thermal relief valve, schedule 80 coil with stainless cold wrap, and 13" pneumatic tires. For hustle free storage of your water hose, add a swivel hose reel that mounts to the frame.